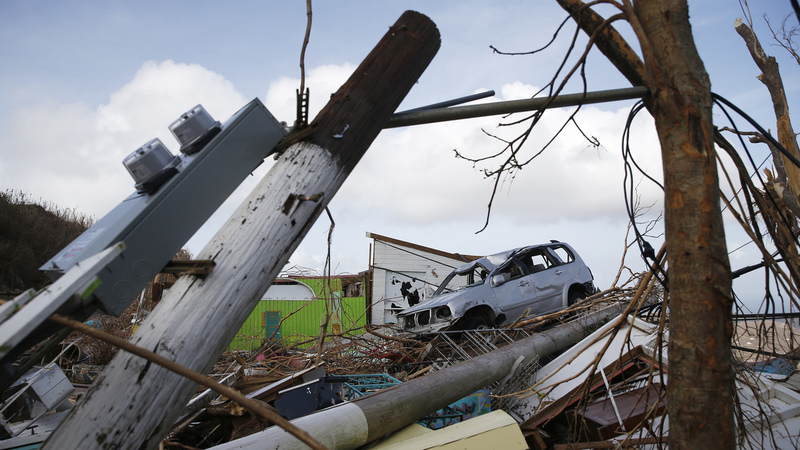 The Virgin Islands, After Irma: 'It Was Like Stepping Onto Another Planet' : The Two-Way In the U.S. and British territories, residents tell of winds that could rattle your bones — and of an aftermath like a "war zone." Here are portraits of the devastation, in the survivors' own words. Hurricane Irma arrived on the doorstep of the Virgin Islands just over a week ago. A Category 5 storm, historic in its terrible might, Irma shredded homes and hotels into the bare materials that made them, its winds scattering floorboards and roofs and light poles like so many matchsticks. 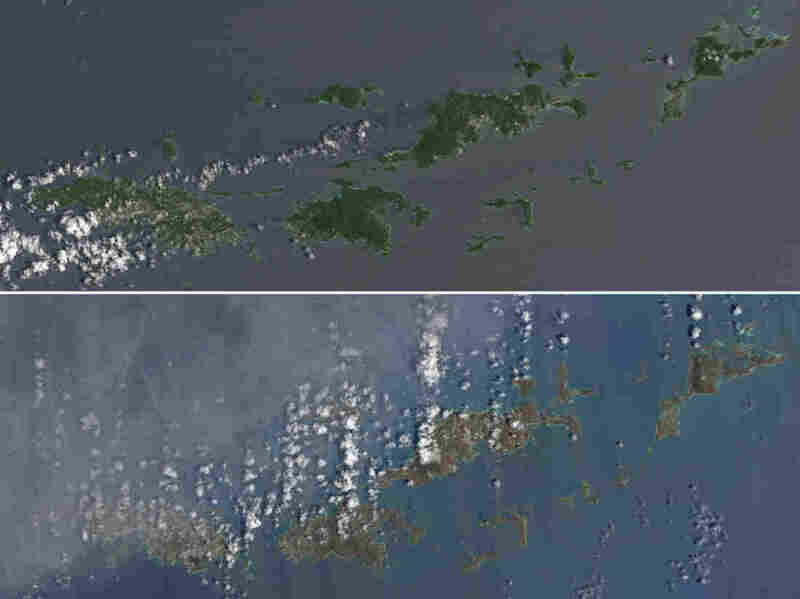 Within a day, the storm had rendered the islands so unrecognizable, satellites could register the stark change from space. Where once the Virgin Islands — both U.S. and British — gleamed green in their lush vegetation, that vista is buried brown beneath uprooted trees and the debris of broken buildings. Two natural-color images provided by the NASA Earth Observatory depict the U.S. and British Virgin islands: The top image shows the verdant islands prior to the passage of Hurricane Irma; the bottom image shows the brown the storm left behind after uprooting and wrecking much of the island chain. As nightmarish as those hours were, the days since have seemed a lifetime for many residents of the U.S. and British territories. "While there were some homes that survived — some lost just roofs — there are homes that are totally obliterated right down to the foundation," David Mapp, executive director of the Virgin Islands Port Authority, tells NPR's Jason Beaubien. "I mean, all you see is rubble." More than eight days after the storm swept through, U.S. Virgin Islands Gov. 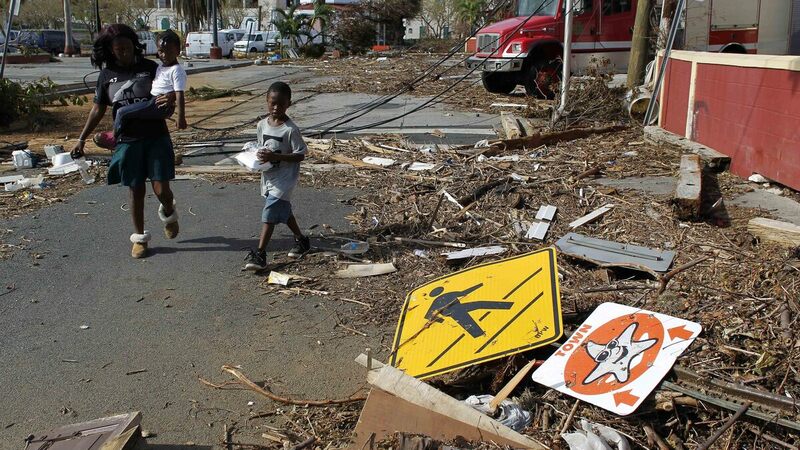 Kenneth Mapp tells NPR's Ari Shapiro that St. Thomas and St. John — the two hardest-hit islands on the U.S. territory — are both almost entirely without power. All but 10 percent of the power lines lie in disarray on St. Thomas, which had its one hospital rendered useless by Irma. 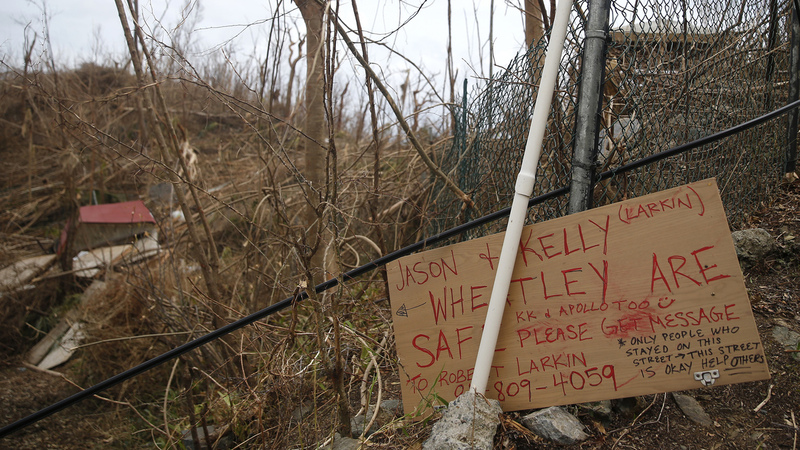 For residents of the Virgin Islands, the aftermath has been a time of despair, fear — and occasionally, against seemingly impossible odds, some hope. Here are some of their stories, in their own words: Three portraits of the grave new world Irma wrought. The sun glares down on a severely damaged apartment unit in a St. Thomas high-rise on Tuesday. Many residents say they lost everything to the Category 5 storm, and days later they're still grappling with how to respond to the rampant destruction. 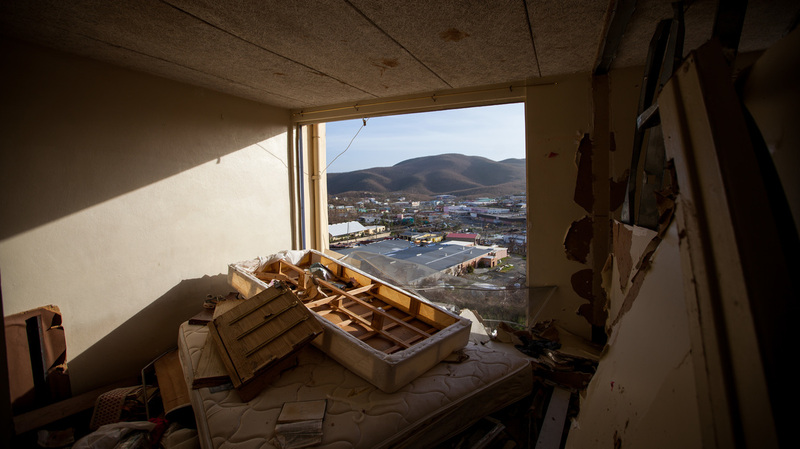 When the storm hit St. Thomas, Laura Dixon Strickling says, she could feel the winds raging not only outside her shelter but even inside her very skin. "The pressure — you could feel it in the middle of each bone in your body. It felt like you were going to explode from the inside," she told NPR over the phone. She was holed up in her landlord's basement with her husband and 15-month-old child, along with another couple and their baby. They had packed that basement full with supplies. And as they hunkered down below the storm, they watched it from above, staring at satellite trackers of Irma's progress on their phones. All the while, the winds scoured every surface for a hole, raging to get in. "It's like you're being assaulted in every possible way." When the storm had finally passed, she couldn't recognize the neighborhood she had known before descending into the basement. "Shock doesn't begin to describe the feeling of seeing a world that has completely changed. It was like stepping onto another planet. Every green thing was gone. Every tree was snapped. Our neighbors' roofs were missing," Strickland said. "We turned around to find our own roof was still there — and you know, there's a lot of relief in that moment. Because you know that you are going to at least have the things you need for basic survival." Once a gift shop for tourists, this building in St. John was on Tuesday no more than a heap of broken trees, fallen light poles and the tossed carcass of an SUV. Elsewhere on the island, Jeff Neevel also escaped the worst of it. He had chosen to ride out the hurricane in his own home, which he had built with heavy-duty materials after Hurricane Marilyn made debris of his last house more than two decades ago. "We lost a window and a tree fell on my truck and all that stuff," Neevel told NPR in a phone call. "But that's minor. That's minor from what other people experienced and what they're having to put back together." Neevel, the pastor of the St. Thomas Reformed Church, said that when the storm had passed and he walked out to find minimal damage, he took it as a sign: "It's my time to give instead of receive." "After the storm, we all kind of went out and said, 'OK, there it is.' It's horrible, but what do you do? You've got to bend down and pick something up and move it and put it back in its place," Neevel says. "And that's what we did." 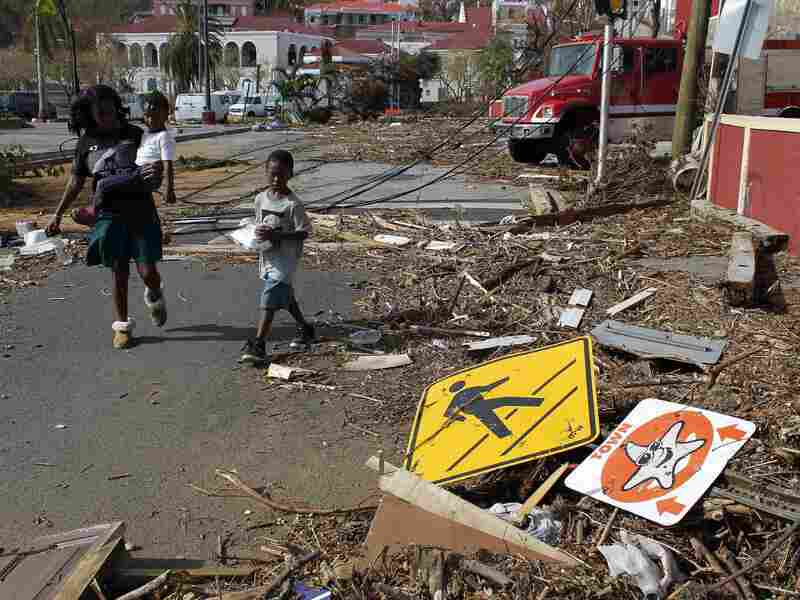 A woman and her two children pass the debris left of the streetside in St. Thomas, U.S. Virgin Islands, on Sunday. Together with My Brother's Workshop, the Salvation Army, the Red Cross and other churches in the area, Neevel says his congregation quickly got to work to "get people set and basic needs met." That means food for more than 400 people a day, canned goods, hygiene kits and diapers for lines of people that stretch out the door. "And this is all — that I know of — private citizens, nonprofits, churches that are working together to make this happen. I have no idea what's happening on the government level." He has heard helicopters overhead, he has heard that trucks are on the road, he knows the Coast Guard has been unloading supplies — but "the stuff that we requested, we haven't seen." Strickling said she felt the absence of federal assistance acutely. "I think all of us expected that we would see some sort of official presence on the ground within a day," she said, noting that her house rests on one of the island's major transit arteries — and yet she said she saw no one. "By Day 3, sitting there waiting to see a uniform, waiting to see some evidence that help was coming, that's when we started to panic." Melody Zhang, a physician assistant student who had moved to St. Thomas just two weeks before Irma arrived, told NPR by email that she was trapped in her neighborhood for days by impassable roads, but "neighbors invited me in to their home to share their generator." By Saturday, she had found a boat willing to take her and her fellow students off the island — but she had to act fast. "So I left behind everything except my backpack and the clothes on my back and was able to get to safety." And she had reason to worry, it seems: Some people who remained on the island said they witnessed a breakdown of law and order immediately after Irma. "The first couple days, I walked around town here. There was some looting I saw going on and some tensions running high," Neevel said. "It was kind of crazy, like a war zone, and people were just walking around like zombies." Still, he stuck it out — and in recent days, he has seen a marked change. "Now, people are coming here [to the church], they're getting fed, we're sharing stories, handshakes and hugs, and they're going away with a little bit of food to get through the day," he said. "I think things are looking brighter and under some sort of control." Concerned for her baby's health and still frustrated by the official response, Strickling decided to leave the island on Monday, five days after Irma hit. When she and her family left, they did so on a private boat, part of a group of civilians she affectionately nicknamed the "Puerto Rican navy" — "civilian boats, filled with supplies that Puerto Rican citizens donated to help the people of St. Thomas." "They risked their livelihood to come and get us," she said, adding that the man helming the boat didn't have power or water at his house back in Puerto Rico, either. Yet he took his boat out to help them. "I don't know any better example of like the goodness of humanity than that man and his crew." In the absence of cell service Wednesday, a sign serves to communicate that some residents of St. John's Coral Bay are safe. 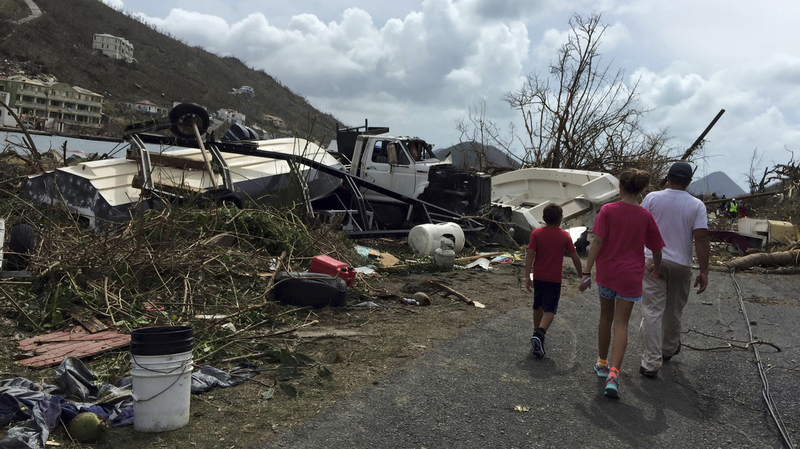 Rebecca Ostrander had been vacationing with her family of six on St. Thomas — that was, before the hurricane was upgraded. At that point, they left the villa they had reserved and headed to a hotel on St. John that was better built to withstand a hurricane. Still, Irma battered the Westin. "The sound of the wind was like standing next to a jet engine. Our ears were popping from the pressure, and when a gust hit, it felt like all the air was sucked out of the room," she told NPR in an email. "The Westin was destroyed, but we were so thankful to survive." But the days that followed promised more woe for residents. As Gov. Mapp acknowledged Wednesday, St. John is "100 percent without power except for standby power generation" — and, he added, "we did have some security issues on St. John." "We've just been very busy amassing security apparatus on St. John, getting them fully protected, getting relief supplies, tarpaulins, water, meals, medicines to our citizens," he told NPR's Ari Shapiro. "The bottom line is we are getting tremendous help from our federal partners. But the U.S. Virgin Islands need help." Hannah Stein phrased the matter more bluntly. In a Facebook post saying she had spoken Wednesday with her mother, a St. John resident living in Coral Bay, Stein described the scene. "She said it's like a war zone," Stein relayed. "They sleep with knives next to their beds and fear for their safety. 'People have nothing,' she said, 'and they're getting robbed of the nothing they have.' "
"Where they are at least," Stein added, "they're on their own." After Hurricane Irma passed last week, a group of survivors take stock of the damage on Tortola, in the British Virgin Islands. Paul Exner and his family have continued to stay in their "blown-out house in the semi-rural community of Josiah's Bay" on the island of Tortola. "We function between insomnia, sleep deprivation, and adrenaline," Exner wrote in a Facebook post Wednesday. Some food stores remain open but are packed and pricey, he said, and the clinic has been straining to treat people with "injuries ranging from blindness from flying glass, nails in feet, bee stings, high blood pressure, delirium, broken bones from falling (or flying with the wind in the case of one person), and one gunshot wound to a burglar's head." Even as the residents struggle to regain their footing, there is another segment of the island's population that has been flourishing in recent days: the bugs. "The insect population has exploded and they're pissed off .. swarming the humans aggressively," he said. "We are all equals upon planet earth." Millions of crickets — "rare varieties never seen before ranging in size and color spectrum" — bees and Jack Spaniard wasps have made the damp wreckage their playground, emboldened and aggressive after the brutal storm. Exner said he spoke with a British commando now stationed on the island, who noted that while there had had been some looting and that some prisoners had escaped confinement during Irma — beneficiaries of a blown-down fence — the security situation on the island was coming under control. Offered a chance to evacuate Tortola by private plane Tuesday, Exner said he declined. "The British Virgin Islands is our home."